Convivium contributor Daniel Bezalel Richardsen reflects on the recently convened Faith in Canada 150 Millennial Summit and the hope he derived from this historic gathering. It was halfway through the morning that I realized that I was participating in one of the most important public engagements of Canada’s sesquicentennial. My dear friend Mozynah, an Egyptian Muslim, tracked me—an Indian Christian—down to access the “prayer room” in which I’d earlier spent a few moments of quiet devotion. “Ah, you were praying!” she nodded smilingly as I led her to the room before returning to the proceedings of the Faith in Canada 150 Millennial Summit held that day at the newly-opened Global Centre for Pluralism. Such an intimate and essential part of oneself immediately recognized and affirmed. Good morning, heart-warm. 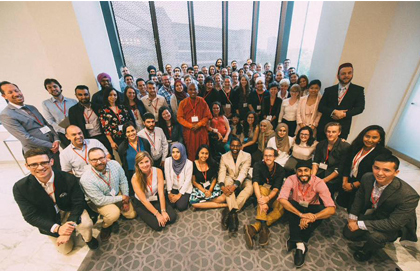 In gestation for over two years since Cardus had decided to mark Canada’s century and a half of Confederation, the summit brought over 75 millennials—that amorphous cabal—of different faiths from across Canada together to dialogue and build friendships. I regularly partake in the fruitful, if sometimes plodding, work of ecumenical (i.e., intra-Christian) colloquies and I really did not have clear or big expectations going into this multi-faith gathering. Looking back over the course of four days at the summit, my heart is brimming over with hope. The opening evening reception presented opportunities for many of us to meet for the first time, and I recall vividly conversations with a Bhante, a technology-savvy Buddhist monk, and Navaid Azizan, an imam from Calgary. They both spoke about how their visibly religious markers evoke various public responses while the latter also expressed the challenge he faced in giving his two daughters a sufficient Muslim education. I also remember Chemi—a Tibetan Buddhist who spent a large portion of her childhood in India—who delighted a group of Sikh and Muslim delegates, astounded at her verbal prowess with Hindi and Tamil phrases, all captured on Snapchat. Each of us in that moment represented the richness of the most religiously diverse region of the planet in the Indian subcontinent, gathered for the purpose of enjoying a genuine, joyous encounter as people of faith here in our new country, Canada. I am not just being sentimental in relaying these anecdotes. I recently watched the 1964 Italian movie Il deserto roso by Michelangelo Antonioni. Hearing Cardus Executive Vice President Ray Pennings speak at the summit about the necessity of communities of faith for our civic ecology, I was reminded of the film’s desolate and desiccated industrial mise-en-scène that analogized a faithless arid secularism accurately. Canada’s democracy simply cannot flower for long without the fertile soil of generosity and diversity that communities of faith bring. Looking back over the course of four days at the summit, my heart is brimming over with hope. A country is not a managerial program. It is a place and the people who live in it. Over some three quarters of Canada’s land, Aboriginals [sic] and other northerners are the Canadians present and established twelve months of the year, every year. They are the physical expression of Canada’s sovereignty. Listening to Rev. Ray Aldred, a status Cree, deliver the keynote address, I was heartened by the many faces that resembled mine own in the room, who keenly responded to the message of the obligation of true relational reconciliation that goes beyond litigious efforts, as essential as they may be. Our mutual woundedness requires spiritual resources in addition to material and personal ones. One of the topics that came up during our discussions is how extremism and radicalization need not mean the fearful, ominous things they denote in our public discourse. A deepening of Sikh devotion could mean greater hospitality. A greater adherence to Torah readings and Daf Yomi (the daily regimen of reading the Talmud or the Oral Law) could lead to more thoughtful living. An engagement with the social doctrines of the Catholic Church could lead to an increased desire for justice. Radicalization, in the etymological sense, means a return to roots. Rabbi Jonathan Sacks and others have stressed the importance of good theology to replace bad, rather than the knee-jerk effacement of all discussions of God and faith that a secularist society may be prone to. And we see ample evidence, as noted by David Bromwich in the London Review of Books, that “the religion of humanity [secularism] may turn out to be as dangerous as all the other religions,” once uprooted from its source by wilful amnesia and obfuscation. Indeed, the brave imams engaging in theological persuasions online and in their congregations are actually most likely to be effective in espousing peaceful coexistence, and unsurprisingly attracting the ire of religious supremacists. Imam Slimi, one of the Cabinet of Canadians, issued to passionate paean against this very religious supremacy, and his beneficence was amply in view as he attended a special Mass as an observer with some Catholic delegates of the summit in the crypt of Notre Dame Cathedral for the Solemnity of Saints Peter and Paul. One of the challenges issues earlier that afternoon was to invite each other to our places of worship, and it was heartening to see the swiftness with which this call was heeded. A consensus that emerged during our conversation was that while we willed the good of our own faith communities, and desired fraternal bonds with others who did not share our faith, we also emphasized that we sought the good of those of no faith at all, which would include many of our fellow citizens. One cannot stress this point enough. This requires a greater engagement with the culture at large, in institutions and organs that are decidedly outside the ones of faith communities. Journalists, musicians, poets, novelists and others all need apply. To paraphrase the words of Christ, if we have lost our distinctive saltiness or flavour, what good would we be? As James K.A. Smith underlines in Comment, “thick, particular, unapologetic religious communities are exactly what we need to sustain a healthy civil society and foster civil public discourse.” The summit demonstrated this in miniature. Later, as the pope began his homily, there was a sudden change in the weather: The rain came in great horizontal sheets that left nothing or nobody undrenched. The pope abandoned his homily; it became uncertain that the event could continue. Then Benedict began to speak again. He said the Lord had sent the rain as a gift. He told the young people that they would encounter ­trials in their lives much worse than this, but should not be fearful because they would be accompanied always. “Your strength is stronger than the rain,” he said. Then, with the storm still raging, the pope knelt before the Blessed Sacrament and two million young people lapsed into silence. Seasoned policemen afterwards said that, had a storm like this hit a rock concert or football match, there might have been a major catastrophe. Here, there was silence, stillness, before something immense. The question of whether genuine pluralism is possible without lapsing into relativism is a good one, especially as at the other spectrum we could be left withholding dogmatic and immutable religious beliefs refusing to encounter the other in dialogue and friendship. During a talk, Balpreet Singh Boparai, the legal counsel of the World Sikh Organization of Canada, recounted a wonderful story from his tradition that emphasized solidarity, one of Bhai Kanhaiya who served water even to enemy soldiers. When asked to explain himself, Kanhaiya’s response was that he did not see an enemy, but only human beings. This is the same essential belief that compels me to say as a Christian, Dominus Iesus (Jesus is Lord), and have a deep reverence for my fellow human beings as stamped indelibly with the image of God. Revering all human beings does not mean erasing their difference or demanding a relation with them on unilateral terms. As our Indigenous friends keep reminding us, human beings are a unity. It is the particularity of each person that adduces his or her sanctity. Andrew Bennett, the Chair of the Cabinet of Canadians, reminded us that the Muslim woman wearing her hijab, and the Sikh wearing his turban, along with the collar of the priest are tangible reminders of faith in the public sphere that we should all applaud and defend with gratitude as fellow believers and citizens. As we reflect on the gift of this gathering, I am struck with wonder about it. It is clear to me that we need to continue to work within our own faith communities to strengthen them, and to have a posture of invitation where we welcome others not just into our homes, but especially into our places of worship. Looking ahead to 2067, it’s hard to predict what will transpire in the ensuing decades. But I’m certain that our places of worship will continue to thrive. Gustav Mahler, the German composer, once said, “Tradition is not the worship of ashes, but the passing on of the flame.” While carrying the torch, and looking to pass it on, I hope that the camaraderie and nobility of my peers will strengthen Canada’s common good in the years ahead. Whether they lead quiet virtuous lives like George Eliot’s Dorothea in Middlemarch or be a gallant public witness like Alessandro Manzoni’s Cardinal Borromeo in The Betrothed, I pray that we keep and pass on the flame as we “vie one with another in good works.” (Qur’an, Al-Maidah, 5:48) I for one, like the Blessed Virgin, will keep all these things and ponder them in my heart for a long while. Daniel Bezalel Richardsen is an advisory member of the Millennial Network of Faith in Canada 150. Daniel is the founder of Foment, the literary journal of the Ottawa International Writers Festival; a Global Shaper with the World Economic Forum's Ottawa Hub; and is a Prize Advisor to The Ross and Mitchell Prize for Faith and Writing.